Canadian women’s basketball team head coach Lisa Thomaidis of the U of S Huskies addresses her players during a recent exhibition game (courtesy of Basketball Canada). Eighteen years ago, it would have been hard for Lisa Thomaidis to ever imagine a season like this. Back in 1998 at the age of 26, Thomaidis began her coaching career with the monumental task of taking over a struggling University of Saskatchewan Huskies women’s basketball team that had one of the worst records in the country. Today, the Huskies are a perennial powerhouse and reigning Canadian Interuniversity Sport national champions under Thomaidis, who has now turned her attention to taking Canada to the medal podium at the Summer Olympic Games in Rio de Janeiro next month. Looking back, it’s all a little surreal for Thomaidis, who was named national team head coach in 2013 and successfully guided Canada to a berth in the Olympics at the qualifying tournament in Edmonton in 2015 after winning gold at the Pan-Am Games in Toronto last summer. Now she is days away from coaching Canada’s team in the world’s most spectacular sporting spectacle. “Way back then, thinking about going to an Olympics, let alone as the head coach, wasn’t even in the realm of possibility when I first got the job,” said Thomaidis. “But it’s going to be fantastic. Thomaidis is one of a half-dozen members of Canada’s contingent heading to the Rio Games who have U of S Huskies connections, along with athletes Gavin Schmitt, Jillian Gallays, Taryn Suttie and Erica Gavel, as well as medical staff member Al Bodnarchuk. One of Thomaidis’ top Huskies players, CIS all-Canadian Laura Dally, spent the summer with the national women’s basketball team and was one of 16 players still under consideration before the final 12-player Olympic roster was finalized today. For her part, leading the Olympic team is one of the highlights of Thomaidis’s career and something she could have only dreamed of when she stepped onto the campus at the U of S some 18 years ago. Thomaidis took over a Huskies program that had won only 34 of its 270 games over the previous 16 seasons, and turned it into one of the best in the country, winning four Canada West league titles, being named conference coach of the year five times and the CIS coach of the year three times. 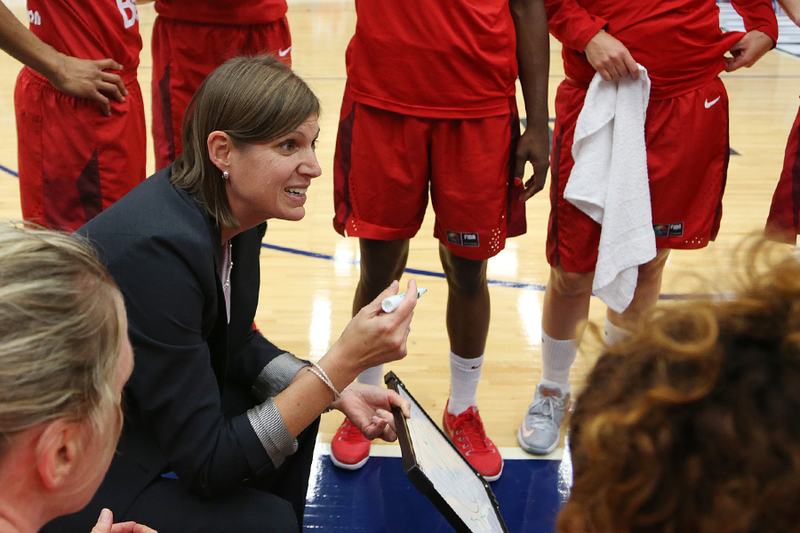 Her coaching acumen was quickly recognized by Basketball Canada, which first brought her in as an apprentice coach back in 2001 and she has been with the national team program ever since. Now she has Canada daring to dream of a medal at the Summer Olympics, a moment that would be the pinnacle of her coaching career. Thomaidis and Team Canada open the Olympic competition by battling China on Aug. 6 in Rio de Janeiro. Here’s a look at the other U of S Huskie connections at the Summer Olympics from Aug. 5-21 and the Paralympics from Sept. 7-18. Jillian Gallays: Originally from nearby St. Brieux before moving to Saskatoon, the 29-year-old Gallays qualified for her first Olympics by winning a Pan American title in March after overcoming a serious knee injury in 2015. Gallays, who was diagnosed with dyslexia as a youngster, competed for the Huskie wrestling team and won two CIS national championships while earning her Bachelor of Science in Kinesiology. A six-time national champion, Gallays has previously competed in a Commonwealth Games and two world championships, winning bronze at both the Commonwealth Games and the worlds in 2014. She is scheduled to compete on Aug. 18 in the 53-kilogram weight class at the Olympics. Erica Gavel: A former member of the Huskie women’s basketball team from 2009-2012, Gavel’s career was cut short when she suffered her third serious knee injury in three years. The Prince Albert product picked up the sport again when she tried wheelchair basketball in 2012, earning a scholarship to the University of Alabama and going on to make Canada’s senior women’s wheelchair basketball team in 2014. The 25-year-old Gavel, who earned a Bachelor of Science in Kinesiology in 2012 at the U of S, was officially named to our Paralympic team in March. Gavel and the Canadian team hit the court for the first time on Sept. 8. Gavin Schmitt: Canada qualified this year to compete in men’s volleyball at the Olympics for the first time in 24 years, with a helping hand from the former Huskie standout. The 30-year-old Schmitt, who suited up for one season at the U of S and helped the Huskies qualify for the 2006 national championship, played a key role in Canada’s qualifying run in the spring after playing professionally in Turkey in 2015-16. The 6-foot-10 power hitter, who battled back from stress fracture surgery in January to help Canada qualify, tuned up for the Olympics at home in Saskatoon during World League action in June. Schmitt and Canada play their opening match on Aug. 7. Taryn Suttie: The 25-year-old from Hanley, Sask., will compete in shot put for Canada in her first Olympic Games. Suttie, who had a record-setting CIS career with the U of S Huskies, was officially named to the track and field team earlier this month after the Canadian championships in Edmonton. She qualified for the Olympics in April with a personal best throw of 17.88 metres. Suttie, who studied kinesiology at U of S, was a double gold medallist at the 2011 CIS track and field championships and finished 10th in shot put at her first Pan Am Games in Toronto in 2015. She is scheduled to compete in her event in Rio on Aug. 12. Al Bodnarchuk: Bodnarchuk will be making his fifth trip to an Olympics next month in Rio as part of the Canadian medical staff, scheduled to work at the Paralympics and serve as an alternate for the Summer Games staff. The 57-year-old Saskatoon native began his career as a student trainer for Huskie Athletics and worked 18 seasons as head trainer with the track and field team at the U of S. Widely regarded as one of the top massage therapists in the country, Bodnarchuk has also worked with the Canadian team in three Commonwealth Games and eight world championships and helped U of S athletes win three CIS track and field championships and the Huskie football team capture three Vanier Cup titles. Kaylyn Kyle: The 27-year-old former member of the Huskie women’s soccer team is officially one of four alternates for Canada’s Olympic team, but the Saskatoon native will only be called up to make the trip to Rio in the event of an injury. The midfielder was a part of Canada’s bronze-medal winning team at the 2012 Summer Olympics in London. Kyle, who plays professionally with the Orlando Pride, spent one season with the Huskie women’s soccer team in 2006 and was a student at the U of S from 2006-2010. Katie Miyazaki: Miyazaki will make a trip to the Paralympics as a member of Canada’s wheelchair basketball coaching staff. Miyazaki played women’s basketball at the U of S from 2010-12 after transferring from the Simon Fraser University Clan. She was twice named CIS Defensive Player of the Year and helped the Huskies to a Canada West title and CIS silver medal in 2010-11. Miyazaki also represented Canada at the Universiade Games in Shenzhen, China, as well as played women’s football with the Saskatoon Valkyries for two seasons. Obtaining a Master of Public Health from the U of S, the native of Richmond, B.C., is the High Performance Wheelchair Basketball Coach for the Saskatchewan Wheelchair Sports Association.